DEMO DAISY, Birmingham, 02/28/2012, Evening, race 11 post #3. Result: 6-5-8- . JUMP N JIVE, Bluffs Run, 02/28/2012, Afternoon, race 10 post #1. Result: 1-4-5- . STARZ EQUALMIST, Palm Beach, 02/28/2012, Afternoon, race 10 post #7. Result: 2-4-1- . BACS XTREME, Palm Beach, 02/28/2012, Afternoon, race 13 post #5. Result: 2-6-4- . MESA BACKSTOP, Derby Lane, 02/28/2012, Evening, race 12 post #7. Result: 4-2-1- . AMF EX PRESIDENT, Wheeling, 02/28/2012, Afternoon, race 8 post #1. Result: 1-6-4- . WW GALE THIRTY, Wheeling, 02/28/2012, Afternoon, race 16 post #1. Result: 5-7-2- . DODGE CALIBER, Birmingham, 02/29/2012, Afternoon, race 7, post #1. LAVA MATSUI, Birmingham, 02/29/2012, Afternoon, race 9, post #7. ROOFTOP SAWEDOFF, Birmingham, 02/29/2012, Afternoon, race 12, post #8. CTW CHICK MAGNET, Birmingham, 02/29/2012, Evening, race 9, post #3. MC FULL MOON, Bluffs Run, 02/29/2012, Afternoon, race 5, post #7. SLATEX EMERALD, Bluffs Run, 02/29/2012, Afternoon, race 12, post #2. DEMO DAISY, Birmingham, 02/28/2012, Evening, race 11, post #3. JUMP N JIVE, Bluffs Run, 02/28/2012, Afternoon, race 10, post #1. STARZ EQUALMIST, Palm Beach, 02/28/2012, Afternoon, race 10, post #7. BACS XTREME, Palm Beach, 02/28/2012, Afternoon, race 13, post #5. MESA BACKSTOP, Derby Lane, 02/28/2012, Evening, race 12, post #7. AMF EX PRESIDENT, Wheeling, 02/28/2012, Afternoon, race 8, post #1. WW GALE THIRTY, Wheeling, 02/28/2012, Afternoon, race 16, post #1. COACH PRINCESS, Birmingham, 02/27/2012, Afternoon, race 7 post #7. Result: 6-2-4- . CTW CHICK MAGNET, Birmingham, 02/27/2012, Afternoon, race 7 post #8. Result: 6-2-4- . LAVA MATSUI, Birmingham, 02/27/2012, Afternoon, race 7 post #6. Result: 6-2-4- . MAGIC TEMPURA, Orange Park, 02/27/2012, Evening, race 14 post #1. Result: 4-1-7- . MONKEYS UNCLE, Palm Beach, 02/27/2012, Afternoon, race 6 post #3. Result: 3-4-7- . SNEAKY PEEKY, Sarasota, 02/27/2012, Afternoon, race 9 post #3. Result: 8-6-7- . SHANETT, Southland, 02/27/2012, T, race 16 post #6. GAME PLANE, Tucson, 02/27/2012, Evening, race 2 post #4. Result: 1-6-7- . It has only been two months since Spry Derosa of K-Rod Kennel was featured as the Greyhound of the Week. 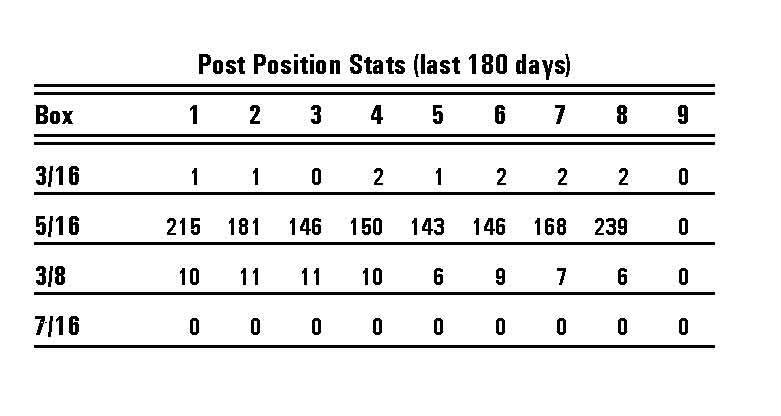 During the month of February, no other greyhound has been `hotter` than Spry Derosa winning three out of her last four starts to claim the honors once again. After turning just two years old in November, the 59-pound red female bred from Dodgem by Design – Dancer Drive still has plenty of gas of in the tank and is currently one of the top greyhounds at Gulf Greyhound Park. D.Q. Williams Kennel, trained by Craig Edwards, dominated the racing scene this week at Gulf Greyhound Park to earn the Kennel of the Week honors. With 67 starts, D.Q. 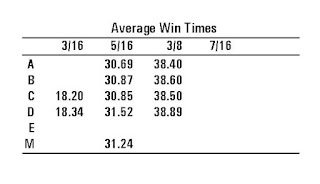 Williams Kennel had 12 wins, 14 seconds, 8 thirds and 13 fourth place finishes breaking the five figure barrier with $10,468.53 in purse earnings. There was only one top grade victory this week accomplished by Grits and Gravy on Saturday afternoon. D.Q. 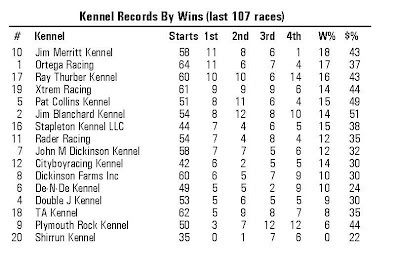 Williams Kennel has extended their lead on top of the kennel standings to six over K-Rod Kennel and nine over Libby Racing Kennels. COACH PRINCESS, Birmingham, 02/27/2012, Afternoon, race 7, post #7. CTW CHICK MAGNET, Birmingham, 02/27/2012, Afternoon, race 7, post #8. LAVA MATSUI, Birmingham, 02/27/2012, Afternoon, race 7, post #6. MAGIC TEMPURA, Orange Park, 02/27/2012, Evening, race 14, post #1. MONKEYS UNCLE, Palm Beach, 02/27/2012, Afternoon, race 6, post #3. SNEAKY PEEKY, Sarasota, 02/27/2012, Afternoon, race 9, post #3. SHANETT, Southland, 02/27/2012, T, race 16, post #6. GAME PLANE, Tucson, 02/27/2012, Evening, race 2, post #4. SLATEX TOPAZ, Bluffs Run, 02/26/2012, Afternoon, race 8 post #3. Result: 3-6-8- . KIOWA VANESSA, Orange Park, 02/26/2012, Afternoon, race 11 post #5. Result: 4-2-1- . MANIC MAC ELROY, Tri-State, 02/26/2012, Evening, race 10 post #2. Result: 2-7-6- . MANI STRONG, Tri-State, 02/26/2012, Evening, race 12 post #4. Result: 7-5-8- . FLYING KILLERBEE, Wheeling, 02/26/2012, Afternoon, race 7 post #5. Result: 4-6-1- . DEMO DAISY, Birmingham, 02/25/2012, Afternoon, race 4 post #6. Result: 5-8-2- . LAVA MATSUI, Birmingham, 02/25/2012, Afternoon, race 12 post #8. Result: 8-4-6- . ROOFTOP SAWEDOFF, Birmingham, 02/25/2012, Evening, race 8 post #5. Result: 8-6-5- . DODGE CALIBER, Birmingham, 02/25/2012, Evening, race 14 post #6. Result: 6-8-2- .GALE WW WYNONO, Bluffs Run, 02/25/2012, Afternoon, race 10 post #5. Result: 7-8-3- . JET FORCE, Bluffs Run, 02/25/2012, Afternoon, race 13 post #5. Result: 3-1-2- .CRS SPIDER WEB, Melbourne, 02/25/2012, Evening, race 5 post #4.ORANGE PASS, Orange Park, 02/25/2012, Afternoon, race 2 post #5. Result: 6-8-1- . WP'S CLINTON, Orange Park, 02/25/2012, Afternoon, race 7 post #5. Result: 2-1-5- . WW'S GUCCI, Orange Park, 02/25/2012, Evening, race 15 post #4. Result: 7-1-6- .UHAUL MUFFIN, Palm Beach, 02/25/2012, Afternoon, race 2 post #1. Result: 1-8-7- . KCK CANDIBAR, Palm Beach, 02/25/2012, Afternoon, race 4 post #7. Result: 3-7-1- . AMF SULTANA, Palm Beach, 02/25/2012, Afternoon, race 12 post #2. Result: 1-6-4- . SLATEX TOPAZ, Bluffs Run, 02/26/2012, Afternoon, race 8, post #3.KIOWA VANESSA, Orange Park, 02/26/2012, Afternoon, race 11, post #5.MANIC MAC ELROY, Tri-State, 02/26/2012, Evening, race 10, post #2. MANI STRONG, Tri-State, 02/26/2012, Evening, race 12, post #4.FLYING KILLERBEE, Wheeling, 02/26/2012, Afternoon, race 7, post #5. DEMO DAISY, Birmingham, 02/25/2012, Afternoon, race 4, post #6. LAVA MATSUI, Birmingham, 02/25/2012, Afternoon, race 12, post #8. ROOFTOP SAWEDOFF, Birmingham, 02/25/2012, Evening, race 8, post #5. DODGE CALIBER, Birmingham, 02/25/2012, Evening, race 14, post #6.GALE WW WYNONO, Bluffs Run, 02/25/2012, Afternoon, race 10, post #5. JET FORCE, Bluffs Run, 02/25/2012, Afternoon, race 13, post #5.CRS SPIDER WEB, Melbourne, 02/25/2012, Evening, race 5, post #4.ORANGE PASS, Orange Park, 02/25/2012, Afternoon, race 2, post #5. WP'S CLINTON, Orange Park, 02/25/2012, Afternoon, race 7, post #5. WW'S GUCCI, Orange Park, 02/25/2012, Evening, race 15, post #4.UHAUL MUFFIN, Palm Beach, 02/25/2012, Afternoon, race 2, post #1. COACH PRINCESS, Birmingham, 02/24/2012, Evening, race 7 post #3. Result: 8-7-2- . CTW CHICK MAGNET, Birmingham, 02/24/2012, Evening, race 7 post #6. Result: 8-7-2- . MC FULL MOON, Bluffs Run, 02/24/2012, Afternoon, race 9 post #8. Result: 6-1-4- .DLT EXTRACTOR, Gulf Greyhound, 02/24/2012, Evening, race 5 post #7. Result: 3-8-2- . ROUGH HUSTLE, Gulf Greyhound, 02/24/2012, Evening, race 13 post #8. Result: 3-6-2- .KB'S HASLET, Mardi Gras, 02/24/2012, Evening, race 2 post #8. Result: 4-5-6- .JUST TERRIFIC, Palm Beach, 02/24/2012, Afternoon, race 11 post #4. Result: 2-7-1- . ALL-FEMALE FIELD SET TO COMPETE IN THE 81st EDITION OF PALM BEACH KENNEL CLUB’S $50,000 JAMES W. PAUL 3/8ths MILE DERBY THIS SATURDAY AFTERNOON, FEBRUARY 25! West Palm Beach, Fl. – The Gals Rock!!! It’s the year of the females in this Saturday afternoon’s 81st running of Palm Beach Kennel Club’s $50,000 James W. Paul 3/8ths Mile Derby. This long-standing event at the Kennel Club is making history with an all-female field. The eight Derby finalists include the best middle-distance runners that earned the most points in qualifying to make it to the final. Mike Jameson, track announcer and expert handicapper, named Pat Collins / Neola Joe Kennel’s JS Kerry Oki as the early favorite. Kerry drew the favorable #1 post position and is considered one of PBKC’s most-versatile racers. 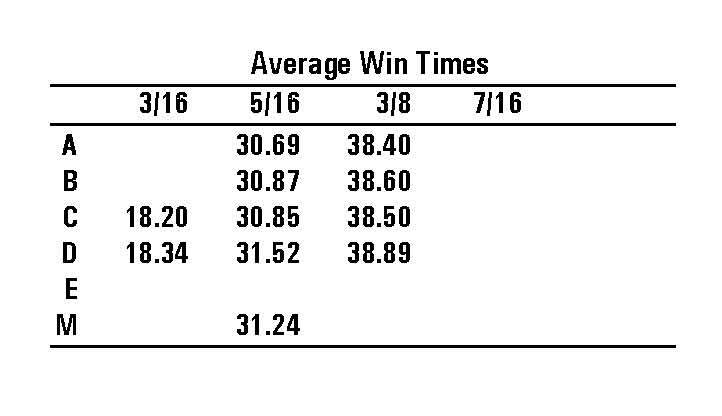 Another standout is #4 BM Murphy (Brindle Kennel), who earned the most points in Derby qualifying with three wins and a fourth. #5 Blazin Spitfire (Marsella Racing) will most likely be the sentimental favorite. She is the oldest and least experience entry, who just began her racing career at almost four years old last September. Another Derby standout is #3 Go Bon Nice Lee (Royal Racing) who has dominated on the 3/8ths mile course over the past year and also competed in the 2011 Hes’ My Man Classic. COACH PRINCESS, Birmingham, 02/24/2012, Evening, race 7, post #3. CTW CHICK MAGNET, Birmingham, 02/24/2012, Evening, race 7, post #6. MC FULL MOON, Bluffs Run, 02/24/2012, Afternoon, race 9, post #8. DLT EXTRACTOR, Gulf Greyhound, 02/24/2012, Evening, race 5, post #7. ROUGH HUSTLE, Gulf Greyhound, 02/24/2012, Evening, race 13, post #8. KB'S HASLET, Mardi Gras, 02/24/2012, Evening, race 2, post #8. JUST TERRIFIC, Palm Beach, 02/24/2012, Afternoon, race 11, post #4. BACS XTREME, Palm Beach, 02/24/2012, Evening, race 6, post #1. WW MISTY MONTY, Sanford Orlando, 02/24/2012, Evening, race 13, post #1. MAGIC TORPEDO, Tri-State, 02/24/2012, Evening, race 5, post #2. RED PERSISTENCE, Tucson, 02/24/2012, Evening, race 9, post #6. FLYING HABANERO, Wheeling, 02/24/2012, Afternoon, race 5, post #5. BELLA CUBANARO, Wheeling, 02/24/2012, Afternoon, race 14, post #4. FLYING LAHINCH, Wheeling, 02/24/2012, Evening, race 12, post #3. UCME CHICKABOOM, Wheeling, 02/24/2012, Evening, race 12, post #1. SLATEX EMERALD, Bluffs Run, 02/23/2012, Afternoon, race 7 post #1. Result: 1-5-2- . SNEAKY PEEKY, Sarasota, 02/23/2012, Afternoon, race 3 post #6. Result: 3-8-4- . BELLA DA BULL, Southland, 02/23/2012, Evening, race 11 post #4. Result: 4-8-5- . MESA BACKSTOP, Derby Lane, 02/23/2012, Evening, race 8 post #3. Result: 2-7-8- . GAME PLANE, Tucson, 02/23/2012, Evening, race 13 post #5. Result: 5-7-8- . Round up your knowledge - THonline.com: Off The Track: March is coming on, and with it comes another handicapping tournament. Derby dilemma - THonline.com: Off The Track: As I peruse the lineup for the finals of the 81st running of the James W. Paul Derby Saturday afternoon at Palm Beach, I find a dilemma. It was a monumental week for Atascocita Ester of Libby Racing Kennels winning her first two top grade AA races in back-to-back fashion to earn this week’s Greyhound of the Week honors. 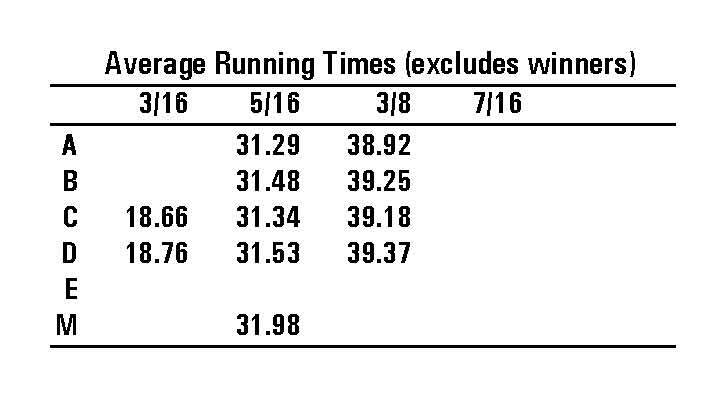 For the most part, the running style of Atascocita Ester favors the outside portion of the racetrack and has shown the flexibility to win on the lead and come from behind after stalking the pace. The 60-pound fawn female bred from Dodgem by Design – Atascocita Barb began her career in July 2011 with two third place efforts before graduating from the maiden class with a front running victory on July 13. Atascocita Ester steadily worked her way up the grade ladder during the remainder of 2011 and her crowning achievement before this week’s grade AA wins occurred on January 27, 2012 with a career best performance of 29.94 seconds in a grade A contest. Make it two weeks in a row for Libby Racing Kennels and trainer Cam Hawkins earning the Kennel of the Week honors. It was well balanced effort amongst the athletes with 11 wins, 11 seconds, 9 thirds and 9 fourth place finishes racking up $9,076.80 in purse money. Leading the way with top grade victories were Night Trouble on Saturday evening and this week’s Greyhound of the Week, Atascocita Ester, winning on Wednesday and Saturday. 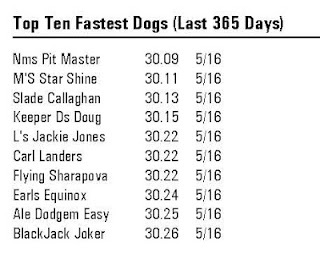 Libby Racing Kennels currently sits third in the kennel standings just six wins behind the Gulf’s top kennel, D.Q. 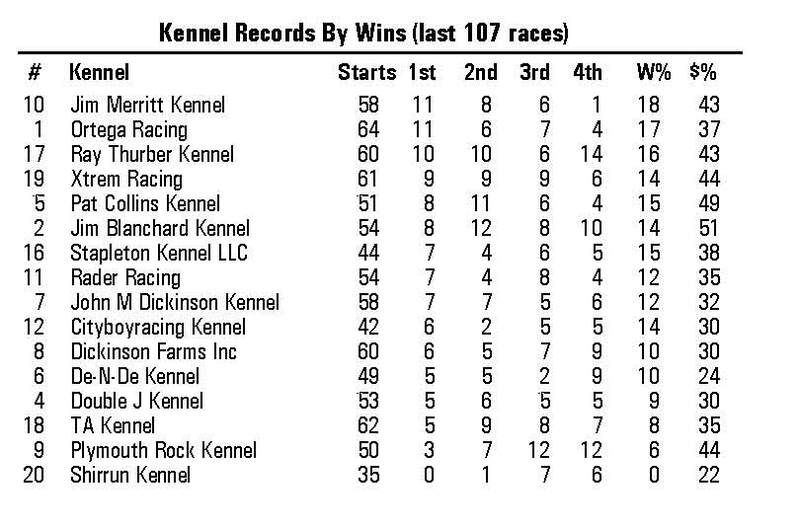 Williams Kennel, and four wins behind K-Rod Kennel. SLATEX EMERALD, Bluffs Run, 02/23/2012, Afternoon, race 7, post #1. SNEAKY PEEKY, Sarasota, 02/23/2012, Afternoon, race 3, post #6. BELLA DA BULL, Southland, 02/23/2012, Evening, race 11, post #4. MESA BACKSTOP, Derby Lane, 02/23/2012, Evening, race 8, post #3. GAME PLANE, Tucson, 02/23/2012, Evening, race 13, post #5. LAVA MATSUI, Birmingham, 02/22/2012, Afternoon, race 11 post #6. Result: 2-8-4- . ROOFTOP SAWEDOFF, Birmingham, 02/22/2012, Afternoon, race 11 post #5. Result: 2-8-4- . POTRS STRIKEOUT, Birmingham, 02/22/2012, Afternoon, race 16 post #8. Result: 2-7-3- . FM SAPPHIRE, Birmingham, 02/22/2012, Evening, race 5 post #6. Result: 7-4-2- . DEMO DAISY, Birmingham, 02/22/2012, Evening, race 7 post #3. Result: 4-3-7- . DODGE CALIBER, Birmingham, 02/22/2012, Evening, race 8 post #3. Result: 6-3-1- . GABLE GO SHAUNEE, Bluffs Run, 02/22/2012, Afternoon, race 3 post #6. Result: 7-3-4- . JUMP N JIVE, Bluffs Run, 02/22/2012, Afternoon, race 6 post #4. Result: 4-1-3- . CRS SPIDER WEB, Melbourne, 02/22/2012, Evening, race 8 post #4. KIOWA VANESSA, Orange Park, 02/22/2012, Evening, race 7 post #1. Result: 7-6-5- . WW'S GUCCI, Orange Park, 02/22/2012, Evening, race 9 post #6. Result: 6-4-8- . MAGIC TEMPURA, Orange Park, 02/22/2012, Evening, race 14 post #3. Result: 1-3-8- . PALM BEACH KENNEL CLUB PRESS CONFERENCE FOR THE $50,000 JAMES W. PAUL 3/8THS MILE DERBY THURSDAY MORNING, FEBRUARY 23! You are cordially invited to attend Palm Beach Kennel Club's press conference for the post position draw for the 81st running of the $50,000 James W. Paul 3/8ths Mile Derby Thursday morning, February 23. 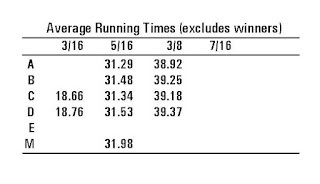 The 3/8ths Mile Derby is one of the longest-running events in the history of Greyhound racing! The event will be held in Palm Beach Kennel Club’s Terrace Restaurant with a start time of 11:45 a.m.
A delicious All-U-Can-Eat Buffet, including desserts and beverages, will be served. Of course, you can also expect a few surprises! Interviews will be available for all media. You can also call 561-683-2222, Ext. 125. We hope to see you Thursday afternoon, February 25! A Greyt time will be had by all! LAVA MATSUI, Birmingham, 02/22/2012, Afternoon, race 11, post #6. ROOFTOP SAWEDOFF, Birmingham, 02/22/2012, Afternoon, race 11, post #5. POTRS STRIKEOUT, Birmingham, 02/22/2012, Afternoon, race 16, post #8. FM SAPPHIRE, Birmingham, 02/22/2012, Evening, race 5, post #6. DEMO DAISY, Birmingham, 02/22/2012, Evening, race 7, post #3. DODGE CALIBER, Birmingham, 02/22/2012, Evening, race 8, post #3. GABLE GO SHAUNEE, Bluffs Run, 02/22/2012, Afternoon, race 3, post #6. JUMP N JIVE, Bluffs Run, 02/22/2012, Afternoon, race 6, post #4. CRS SPIDER WEB, Melbourne, 02/22/2012, Evening, race 8, post #4. KIOWA VANESSA, Orange Park, 02/22/2012, Evening, race 7, post #1. WW'S GUCCI, Orange Park, 02/22/2012, Evening, race 9, post #6. MAGIC TEMPURA, Orange Park, 02/22/2012, Evening, race 14, post #3. STARZ EQUALMIST, Palm Beach, 02/22/2012, Afternoon, race 15, post #2. COUSIN KIM, Sarasota, 02/22/2012, Evening, race 11, post #4. BACKWOOD CODY, Derby Lane, 02/22/2012, Afternoon, race 6, post #8. GABLE EDDIE, Derby Lane, 02/22/2012, Evening, race 6, post #8. GEO DEEDRA, Derby Lane, 02/22/2012, Evening, race 7, post #6. AMF EX PRESIDENT, Wheeling, 02/22/2012, Afternoon, race 12, post #3. KIOWA WW ROMERO, Wheeling, 02/22/2012, Afternoon, race 12, post #2. COACH PRINCESS, Birmingham, 02/21/2012, Evening, race 10 post #3. Result: - - - . CTW CHICK MAGNET, Birmingham, 02/21/2012, Evening, race 10 post #6. Result: - - - . GABLE WARBUCKS, Bluffs Run, 02/21/2012, Afternoon, race 2 post #6. Result: 4-3-2- . GALE WW WYNONO, Bluffs Run, 02/21/2012, Afternoon, race 10 post #7. Result: 5-6-2- . SLATEX TOPAZ, Bluffs Run, 02/21/2012, Afternoon, race 10 post #8. Result: 5-6-2- . JET FORCE, Bluffs Run, 02/21/2012, Afternoon, race 11 post #4. Result: 6-7-1- . UHAUL MUFFIN, Palm Beach, 02/21/2012, Afternoon, race 7 post #4. Result: 8-1-7- . MONKEYS UNCLE, Palm Beach, 02/21/2012, Afternoon, race 12 post #3. Result: 4-1-5- . BD'S RED DAWN, Derby Lane, 02/21/2012, Evening, race 6 post #1. Result: 2-7-3- . OUT D BOX, Tucson, 02/21/2012, Evening, race 9 post #3. Result: 2-6-3- . Pauline O'Donnell's Maria Mandalena came home with a rush to capture the 2012 World Classic Championship at Mardi Gras Friday night, Feb. 17. 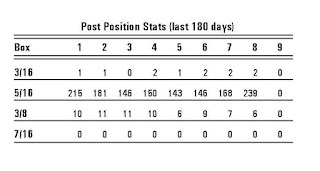 The February 2010 daughter of Kiowa Myth-CDN Crazy To Go, racing from the 7 box, paid $12.60, $5.40 and $4.80 across the board. ORANGE PASS, Orange Park, 02/20/2012, Evening, race 8 post #7. Result: 2-7-3- . WP'S CLINTON, Orange Park, 02/20/2012, Evening, race 12 post #4. Result: 4-3-1- . SHANETT, Southland, 02/20/2012, T, race 11 post #1. MADISON SQUARE, Southland, 02/20/2012, T, race 20 post #8. MANI STRONG, Tri-State, 02/20/2012, Evening, race 15 post #3. Result: 7-8-1- . RAMS CASH CARSON, Tucson, 02/20/2012, Evening, race 6 post #8. Result: 5-6-7-2. RED PERSISTENCE, Tucson, 02/20/2012, Evening, race 6 post #5. Result: 5-6-7-2. WW GALE THIRTY, Wheeling, 02/20/2012, Afternoon, race 17 post #8. Result: 7-3-1- . COACH PRINCESS, Birmingham, 02/21/2012, Evening, race 10, post #3. CTW CHICK MAGNET, Birmingham, 02/21/2012, Evening, race 10, post #6. GABLE WARBUCKS, Bluffs Run, 02/21/2012, Afternoon, race 2, post #6. GALE WW WYNONO, Bluffs Run, 02/21/2012, Afternoon, race 10, post #7. SLATEX TOPAZ, Bluffs Run, 02/21/2012, Afternoon, race 10, post #8. JET FORCE, Bluffs Run, 02/21/2012, Afternoon, race 11, post #4. ORANGE PASS, Orange Park, 02/20/2012, Evening, race 8, post #7. WP'S CLINTON, Orange Park, 02/20/2012, Evening, race 12, post #4. SHANETT, Southland, 02/20/2012, T, race 11, post #1. MADISON SQUARE, Southland, 02/20/2012, T, race 20, post #8. MANI STRONG, Tri-State, 02/20/2012, Evening, race 15, post #3. RAMS CASH CARSON, Tucson, 02/20/2012, Evening, race 6, post #8. RED PERSISTENCE, Tucson, 02/20/2012, Evening, race 6, post #5. WW GALE THIRTY, Wheeling, 02/20/2012, Afternoon, race 17, post #8. KCK CANDIBAR, Palm Beach, 02/19/2012, Afternoon, race 4 post #5. Result: 4-2-1- . AMF SULTANA, Palm Beach, 02/19/2012, Afternoon, race 14 post #2. Result: 5-1-8- . JS KERRY OKI, Palm Beach, 02/19/2012, Afternoon, race 14 post #1. Result: 5-1-8- . MANIC MAC ELROY, Tri-State, 02/19/2012, Evening, race 3 post #2. Result: 5-2-6- . FLYING KILLERBEE, Wheeling, 02/19/2012, Afternoon, race 3 post #8. Result: 1-3-4- . FM SAPPHIRE, Birmingham, 02/18/2012, Evening, race 7 post #2. Result: 7-4-2- . LAVA MATSUI, Birmingham, 02/18/2012, Evening, race 9 post #3. Result: 5-8-6- . ROOFTOP SAWEDOFF, Birmingham, 02/18/2012, Evening, race 9 post #8. Result: 5-8-6- . DEMO DAISY, Birmingham, 02/18/2012, Evening, race 10 post #3. Result: 5-6-8- . DODGE CALIBER, Birmingham, 02/18/2012, Evening, race 15 post #3. Result: 1-2-3- . POTRS STRIKEOUT, Birmingham, 02/18/2012, Evening, race 18 post #5. Result: 4-1-6- . MC FULL MOON, Bluffs Run, 02/18/2012, Afternoon, race 1 post #4. Result: 7-1-2- . ROUGH HUSTLE, Gulf Greyhound, 02/18/2012, Afternoon, race 5 post #4. Result: 5-7-3- . DLT EXTRACTOR, Gulf Greyhound, 02/18/2012, Evening, race 10 post #5. Result: 8-2-5- . KB'S HASLET, Mardi Gras, 02/18/2012, Afternoon, race 4 post #1. Result: 1-2-7- . KIOWA VANESSA, Orange Park, 02/18/2012, Afternoon, race 7 post #5. Result: 2-3-5- . MAGIC TEMPURA, Orange Park, 02/18/2012, Afternoon, race 15 post #6. Result: 8-2-7- . WW'S GUCCI, Orange Park, 02/18/2012, Evening, race 15 post #5. Result: 5-2-6- . BACS XTREME, Palm Beach, 02/18/2012, Afternoon, race 11 post #6. Result: 5-4-7- . JUST TERRIFIC, Palm Beach, 02/18/2012, Afternoon, race 11 post #4. Result: 5-4-7- . RK'S CONK GONK, Palm Beach, 02/18/2012, Afternoon, race 12 post #7. Result: 7-1-5- . SNEAKY PEEKY, Sarasota, 02/18/2012, Afternoon, race 2 post #2. Result: 4-7-8- . BELLA INFRARED, Southland, 02/18/2012, Evening, race 5 post #7. Result: 3-7-8- . MISTIE BASS, Southland, 02/18/2012, Evening, race 18 post #3. Result: 1-3-8- . WW MISTY MONTY, Sanford Orlando, 02/18/2012, Evening, race 15 post #2. Result: 6-7-1- . MESA BACKSTOP, Derby Lane, 02/18/2012, Afternoon, race 8 post #4. Result: 5-4-6- . GEO DEEDRA, Derby Lane, 02/18/2012, Afternoon, race 15 post #6. Result: 5-4-3- . GABLE EDDIE, Derby Lane, 02/18/2012, Evening, race 4 post #1. Result: 8-1-5- . GAME PLANE, Tucson, 02/18/2012, Evening, race 2 post #2. Result: 3-8-5- . CTW ROCKSLIDE, Wheeling, 02/18/2012, Evening, race 6 post #2. Result: 2-3-8- . FLYING LAHINCH, Wheeling, 02/18/2012, Evening, race 7 post #1. Result: 1-2-4- . CTW CHICK MAGNET, Birmingham, 02/17/2012, Evening, race 11 post #4. Result: 5-7-1- . COACH PRINCESS, Birmingham, 02/17/2012, Evening, race 14 post #3. Result: 7-3-6- . SLATEX EMERALD, Bluffs Run, 02/17/2012, Afternoon, race 6 post #3. Result: 5-8-3- . CRS SPIDER WEB, Melbourne, 02/17/2012, Evening, race 4 post #4. WP'S CLINTON, Orange Park, 02/17/2012, Evening, race 5 post #8. Result: 7-1-5- . MONKEYS UNCLE, Palm Beach, 02/17/2012, Afternoon, race 6 post #5. Result: 6-7-5- . STARZ EQUALMIST, Palm Beach, 02/17/2012, Afternoon, race 12 post #7. Result: 2-1-3- . COUSIN KIM, Sarasota, 02/17/2012, Evening, race 2 post #7. Result: 3-1-4- . BELLA DA BULL, Southland, 02/17/2012, Evening, race 7 post #2. Result: 6-4-5- . MAGIC TORPEDO, Tri-State, 02/17/2012, Evening, race 13 post #6. Result: 2-5- - . OUT D BOX, Tucson, 02/17/2012, Evening, race 3 post #5. Result: 1-2-4- . FLYING HABANERO, Wheeling, 02/17/2012, Afternoon, race 17 post #4. Result: 8-2-5- . BELLA CUBANARO, Wheeling, 02/17/2012, Evening, race 11 post #8. Result: 5-2-3- . UCME CHICKABOOM, Wheeling, 02/17/2012, Evening, race 12 post #7. Result: 2-7-1- . FM SAPPHIRE, Birmingham, 02/18/2012, Evening, race 7, post #2. LAVA MATSUI, Birmingham, 02/18/2012, Evening, race 9, post #3. ROOFTOP SAWEDOFF, Birmingham, 02/18/2012, Evening, race 9, post #8. DEMO DAISY, Birmingham, 02/18/2012, Evening, race 10, post #3. DODGE CALIBER, Birmingham, 02/18/2012, Evening, race 15, post #3. POTRS STRIKEOUT, Birmingham, 02/18/2012, Evening, race 18, post #5. MC FULL MOON, Bluffs Run, 02/18/2012, Afternoon, race 1, post #4. SEMIFINALS FOR PALM BEACH KENNEL CLUB'S $50,000 3/8THS MILE DERBY SUNDAY AFTERNOON, FEB. 19! West Palm Beach, Fl. - The fourth and final round of qualifying for Palm Beach Kennel Club’s $50,000 James W. Paul 3/8ths Mile Derby takes place Sunday afternoon February 19. Starting with an original field of 39 hopefuls, there are now 16 Greyhounds who have a shot at making the final eight and an opportunity of winning the $25,000 first-place purse. 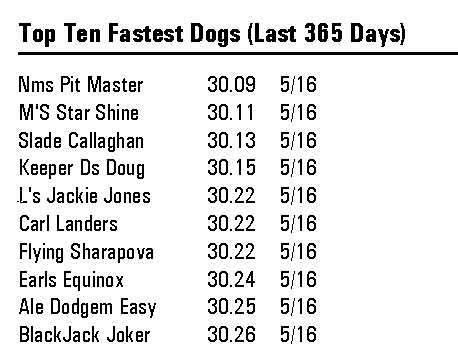 Heading into the semifinals, two Greyhounds are tied for the top spot in point earnings, Royal Racing Team’s stake veteran Go Bon Nice Lee and B & B Racing Kennel’s super-early speedster AMF Sultana, who each scored two wins and a second in qualifying. DODGE CALIBER, Birmingham, 02/15/2012, Afternoon, race 7 post #5. Result: 8-5-6- . CTW CHICK MAGNET, Birmingham, 02/15/2012, Afternoon, race 10 post #2. Result: 1-3-2- . COACH PRINCESS, Birmingham, 02/15/2012, Afternoon, race 12 post #1. Result: 5-1-3- . DEMO DAISY, Birmingham, 02/15/2012, Evening, race 4 post #6. Result: 8-2-6- . FM SAPPHIRE, Birmingham, 02/15/2012, Evening, race 6 post #4. Result: 2-5-3- . ROOFTOP SAWEDOFF, Birmingham, 02/15/2012, Evening, race 8 post #7. Result: 6-3-1- . LAVA MATSUI, Birmingham, 02/15/2012, Evening, race 10 post #5. Result: 5-8-1- . GABLE GO SHAUNEE, Bluffs Run, 02/15/2012, Afternoon, race 1 post #1. Result: 1-2-5- . GABLE WARBUCKS, Bluffs Run, 02/15/2012, Afternoon, race 2 post #7. Result: 2-7-3- . SLATEX TOPAZ, Bluffs Run, 02/15/2012, Afternoon, race 6 post #2. Result: 7-5-4- . DLT EXTRACTOR, Gulf Greyhound, 02/15/2012, Afternoon, race 8 post #8. Result: 5-2-7- . CTW CHICK MAGNET, Birmingham, 02/17/2012, Evening, race 11, post #4. COACH PRINCESS, Birmingham, 02/17/2012, Evening, race 14, post #3. SLATEX EMERALD, Bluffs Run, 02/17/2012, Afternoon, race 6, post #3. CRS SPIDER WEB, Melbourne, 02/17/2012, Evening, race 4, post #4. WP'S CLINTON, Orange Park, 02/17/2012, Evening, race 5, post #8. MONKEYS UNCLE, Palm Beach, 02/17/2012, Afternoon, race 6, post #5. STARZ EQUALMIST, Palm Beach, 02/17/2012, Afternoon, race 12, post #7. COUSIN KIM, Sarasota, 02/17/2012, Evening, race 2, post #7. BELLA DA BULL, Southland, 02/17/2012, Evening, race 7, post #2. MAGIC TORPEDO, Tri-State, 02/17/2012, Evening, race 13, post #6. OUT D BOX, Tucson, 02/17/2012, Evening, race 3, post #5. FLYING HABANERO, Wheeling, 02/17/2012, Afternoon, race 17, post #4. BELLA CUBANARO, Wheeling, 02/17/2012, Evening, race 11, post #8. UCME CHICKABOOM, Wheeling, 02/17/2012, Evening, race 12, post #7. JET FORCE, Bluffs Run, 02/16/2012, Afternoon, race 11 post #8. Result: 8-7-3- . ORANGE PASS, Orange Park, 02/16/2012, Evening, race 5 post #4. Result: 8-5-1- . UHAUL MUFFIN, Palm Beach, 02/16/2012, Afternoon, race 8 post #5. Result: 4-1-2- . BD'S RED DAWN, Derby Lane, 02/16/2012, Evening, race 8 post #8. Result: 1-8-2- . MANI STRONG, Tri-State, 02/16/2012, Evening, race 12 post #3. Result: 4-3-5- . The 2012 edition of the World Classic will be run Friday, February 17th at Mardi Gras Casino & Racetrack in Hallandale Beach, Fl. A prestigious race since inception, previous winners include some of the greatest names associated with greyhound racing: Downing, Wigwam Hoss, Bomb Threat, Kiowa Shawnee So, Kiowa Sweet Trey, Ea's Itzaboy, and many other fan favorites of the game. Winners of this race have gone on to the Hall of Fame and left their mark on the breed not just in the states, but all across the world. This year's edition should be as memorable as in past years. The big names that entered made the final, making it that much more special. There are also young pups trying to become household names all of which should make for an exciting World Classic. DODGE CALIBER, Birmingham, 02/15/2012, Afternoon, race 7, post #5. CTW CHICK MAGNET, Birmingham, 02/15/2012, Afternoon, race 10, post #2. COACH PRINCESS, Birmingham, 02/15/2012, Afternoon, race 12, post #1. DEMO DAISY, Birmingham, 02/15/2012, Evening, race 4, post #6. FM SAPPHIRE, Birmingham, 02/15/2012, Evening, race 6, post #4. ROOFTOP SAWEDOFF, Birmingham, 02/15/2012, Evening, race 8, post #7. LAVA MATSUI, Birmingham, 02/15/2012, Evening, race 10, post #5. GABLE GO SHAUNEE, Bluffs Run, 02/15/2012, Afternoon, race 1, post #1. GABLE WARBUCKS, Bluffs Run, 02/15/2012, Afternoon, race 2, post #7. SLATEX TOPAZ, Bluffs Run, 02/15/2012, Afternoon, race 6, post #2. DLT EXTRACTOR, Gulf Greyhound, 02/15/2012, Afternoon, race 8, post #8. KIOWA DELI DEE, Orange Park, 02/15/2012, Evening, race 4, post #6. WW'S GUCCI, Orange Park, 02/15/2012, Evening, race 9, post #2. JS KERRY OKI, Palm Beach, 02/15/2012, Afternoon, race 12, post #3. AMF SULTANA, Palm Beach, 02/15/2012, Afternoon, race 14, post #8. POTRS STRIKEOUT, Birmingham, 02/14/2012, Evening, race 14 post #6. Result: 4-3-1- . GALE WW WYNONO, Bluffs Run, 02/14/2012, Afternoon, race 15 post #3. Result: 2-6-8- . SNEAKY PEEKY, Sarasota, 02/14/2012, Afternoon, race 14 post #3. Result: 8-3-1- . MESA BACKSTOP, Derby Lane, 02/14/2012, Evening, race 12 post #2. Result: 8-2-6- . RED PERSISTENCE, Tucson, 02/14/2012, Evening, race 9 post #6. Result: 3-8-2- . OUT D BOX, Tucson, 02/14/2012, Evening, race 11 post #5. Result: 3-7-1- . WW GALE THIRTY, Wheeling, 02/14/2012, Afternoon, race 3 post #6. Result: 5-8-1- . KB'S RUCKUS, Wheeling, 02/14/2012, Afternoon, race 12 post #1. Result: 5-2-3- . FLYING KILLERBEE, Wheeling, 02/14/2012, Afternoon, race 16 post #2. Result: 2-7-6- . POTRS STRIKEOUT, Birmingham, 02/14/2012, Evening, race 14, post #6. GALE WW WYNONO, Bluffs Run, 02/14/2012, Afternoon, race 15, post #3. SNEAKY PEEKY, Sarasota, 02/14/2012, Afternoon, race 14, post #3. MESA BACKSTOP, Derby Lane, 02/14/2012, Evening, race 12, post #2. RED PERSISTENCE, Tucson, 02/14/2012, Evening, race 9, post #6. OUT D BOX, Tucson, 02/14/2012, Evening, race 11, post #5. WW GALE THIRTY, Wheeling, 02/14/2012, Afternoon, race 3, post #6. KB'S RUCKUS, Wheeling, 02/14/2012, Afternoon, race 12, post #1. FLYING KILLERBEE, Wheeling, 02/14/2012, Afternoon, race 16, post #2. CTW CHICK MAGNET, Birmingham, 02/13/2012, Afternoon, race 6 post #2. Result: - - - . ROOFTOP SAWEDOFF, Birmingham, 02/13/2012, Afternoon, race 8 post #2. Result: 1-3-2- . DODGE CALIBER, Birmingham, 02/13/2012, Afternoon, race 12 post #5. Result: - - - . CRS SPIDER WEB, Melbourne, 02/13/2012, Afternoon, race 8 post #3. KB'S HASLET, Mardi Gras, 02/13/2012, S, race 1 post #1. KIOWA VANESSA, Orange Park, 02/13/2012, Evening, race 11 post #3. Result: 7-1-6- . MAGIC TEMPURA, Orange Park, 02/13/2012, Evening, race 14 post #2. Result: 5-1-6- . COUSIN KIM, Sarasota, 02/13/2012, Afternoon, race 9 post #3. Result: 6-8-3- . TEN FOR TEE, Sarasota, 02/13/2012, Afternoon, race 10 post #7. Result: 6-4-5- . WW MISTY MONTY, Sanford Orlando, 02/13/2012, Afternoon, race 7 post #8. Result: 3-1-4- . GABLE EDDIE, Derby Lane, 02/13/2012, Evening, race 10 post #4. Result: 1-4-6- . CTW CHICK MAGNET, Birmingham, 02/13/2012, Afternoon, race 6, post #2. ROOFTOP SAWEDOFF, Birmingham, 02/13/2012, Afternoon, race 8, post #2. DODGE CALIBER, Birmingham, 02/13/2012, Afternoon, race 12, post #5. CRS SPIDER WEB, Melbourne, 02/13/2012, Afternoon, race 8, post #3. KB'S HASLET, Mardi Gras, 02/13/2012, S, race 1, post #1. KIOWA VANESSA, Orange Park, 02/13/2012, Evening, race 11, post #3. MAGIC TEMPURA, Orange Park, 02/13/2012, Evening, race 14, post #2. COUSIN KIM, Sarasota, 02/13/2012, Afternoon, race 9, post #3. TEN FOR TEE, Sarasota, 02/13/2012, Afternoon, race 10, post #7. WW MISTY MONTY, Sanford Orlando, 02/13/2012, Afternoon, race 7, post #8. GABLE EDDIE, Derby Lane, 02/13/2012, Evening, race 10, post #4. MC FULL MOON, Bluffs Run, 02/12/2012, Afternoon, race 11 post #2. Result: 5-7-6- . ROUGH HUSTLE, Gulf Greyhound, 02/12/2012, Afternoon, race 10 post #6. Result: 1-4-2- . WP'S CLINTON, Orange Park, 02/12/2012, Afternoon, race 12 post #6. Result: 2-1-6- . KCK CANDIBAR, Palm Beach, 02/12/2012, Afternoon, race 4 post #3. Result: 1-6-8- . BACS XTREME, Palm Beach, 02/12/2012, Afternoon, race 7 post #8. Result: 4-3-1- . MANIC MAC ELROY, Tri-State, 02/12/2012, Evening, race 3 post #2. Result: 4-2-7- . BELLA CUBANARO, Wheeling, 02/12/2012, Afternoon, race 14 post #1. Result: 7-4-1- . COACH PRINCESS, Birmingham, 02/11/2012, Afternoon, race 12 post #3. Result: 1-5-3- . POTRS STRIKEOUT, Birmingham, 02/11/2012, Afternoon, race 13 post #1. Result: 7-2-1- . DEMO DAISY, Birmingham, 02/11/2012, Evening, race 8 post #4. Result: 4-3-7- . FM SAPPHIRE, Birmingham, 02/11/2012, Evening, race 9 post #6. Result: 2-6-4- . LAVA MATSUI, Birmingham, 02/11/2012, Evening, race 14 post #5. Result: 1-5-3- . JUMP N JIVE, Bluffs Run, 02/11/2012, Afternoon, race 2 post #1. Result: 1-3-5- . ORANGE PASS, Orange Park, 02/11/2012, Afternoon, race 10 post #1. Result: 1-8-5- . KIOWA DELI DEE, Orange Park, 02/11/2012, Afternoon, race 11 post #6. Result: 3-2-1- . WW'S GUCCI, Orange Park, 02/11/2012, Evening, race 15 post #7. Result: 7-2-8- . RK'S CONK GONK, Palm Beach, 02/11/2012, Afternoon, race 6 post #3. Result: 3-8-6- . AMF SULTANA, Palm Beach, 02/11/2012, Afternoon, race 14 post #6. Result: 3-6-4- . JS KERRY OKI, Palm Beach, 02/11/2012, Afternoon, race 14 post #4. Result: 3-6-4- . MONKEYS UNCLE, Palm Beach, 02/11/2012, Evening, race 10 post #7. Result: 7-8-5- . JUST TERRIFIC, Palm Beach, 02/11/2012, Evening, race 14 post #3. Result: 4-3-1- . BELLA INFRARED, Southland, 02/11/2012, Evening, race 7 post #6. Result: 6-2-1- . MISTIE BASS, Southland, 02/11/2012, Evening, race 18 post #6. Result: 6-4-1- . BD'S RED DAWN, Derby Lane, 02/11/2012, Afternoon, race 8 post #6. Result: 1-5-6- . MANI STRONG, Tri-State, 02/11/2012, Afternoon, race 15 post #1. Result: 4-3-1- . GAME PLANE, Tucson, 02/11/2012, Evening, race 13 post #1. Result: 3-5-2- . FLYING LAHINCH, Wheeling, 02/11/2012, Afternoon, race 9 post #8. Result: 7-5-4- . CTW ROCKSLIDE, Wheeling, 02/11/2012, Afternoon, race 10 post #1. Result: 5-1-2- . ROOFTOP SAWEDOFF, Birmingham, 02/10/2012, Evening, race 5 post #8. Result: 6-5-8- . DODGE CALIBER, Birmingham, 02/10/2012, Evening, race 12 post #3. Result: 8-5-6- . JET FORCE, Bluffs Run, 02/10/2012, Afternoon, race 8 post #5. Result: 5-7-3- . DLT EXTRACTOR, Gulf Greyhound, 02/10/2012, Evening, race 5 post #4. Result: 4-7-1- . KIOWA VANESSA, Orange Park, 02/10/2012, Evening, race 10 post #7. Result: 7-6-5- . BELLA DA BULL, Southland, 02/10/2012, Evening, race 7 post #8. Result: 1-8-3- . WW MISTY MONTY, Sanford Orlando, 02/10/2012, Afternoon, race 10 post #7. Result: 2-8-1- . SAND CLOUD, Derby Lane, 02/10/2012, Evening, race 6 post #7. Result: 3-6-8- . MAGIC TORPEDO, Tri-State, 02/10/2012, Evening, race 10 post #3. Result: 3-1-6- . ROOFTOP SAWEDOFF, Birmingham, 02/10/2012, Evening, race 5, post #8. DODGE CALIBER, Birmingham, 02/10/2012, Evening, race 12, post #3. JET FORCE, Bluffs Run, 02/10/2012, Afternoon, race 8, post #5. DLT EXTRACTOR, Gulf Greyhound, 02/10/2012, Evening, race 5, post #4. KIOWA VANESSA, Orange Park, 02/10/2012, Evening, race 10, post #7. BELLA DA BULL, Southland, 02/10/2012, Evening, race 7, post #8. WW MISTY MONTY, Sanford Orlando, 02/10/2012, Afternoon, race 10, post #7. SAND CLOUD, Derby Lane, 02/10/2012, Evening, race 6, post #7. MAGIC TORPEDO, Tri-State, 02/10/2012, Evening, race 10, post #3. OUT D BOX, Tucson, 02/10/2012, Evening, race 5, post #7. RAMS CASH CARSON, Tucson, 02/10/2012, Evening, race 9, post #6. AMF EX PRESIDENT, Wheeling, 02/10/2012, Afternoon, race 9, post #8. KIOWA WW ROMERO, Wheeling, 02/10/2012, Evening, race 12, post #4. FLYING HABANERO, Wheeling, 02/10/2012, Evening, race 14, post #7. UCME CHICKABOOM, Wheeling, 02/10/2012, Evening, race 14, post #3. SLATEX EMERALD, Bluffs Run, 02/09/2012, Afternoon, race 11 post #3. Result: 3-1-8- . ROUGH HUSTLE, Gulf Greyhound, 02/09/2012, Evening, race 10 post #1. Result: 3-1-2- . BACS XTREME, Palm Beach, 02/09/2012, Afternoon, race 6 post #1. Result: 7-2-1- . TEN FOR TEE, Sarasota, 02/09/2012, Afternoon, race 7 post #6. Result: 3-7-2- . MESA BACKSTOP, Derby Lane, 02/09/2012, Evening, race 12 post #3. Result: 5-1-3- . RAMS KIZZY KATE, Tucson, 02/09/2012, Evening, race 9 post #7. Result: 4-8-6- . SLATEX EMERALD, Bluffs Run, 02/09/2012, Afternoon, race 11, post #3. ROUGH HUSTLE, Gulf Greyhound, 02/09/2012, Evening, race 10, post #1. BACS XTREME, Palm Beach, 02/09/2012, Afternoon, race 6, post #1. TEN FOR TEE, Sarasota, 02/09/2012, Afternoon, race 7, post #6. MESA BACKSTOP, Derby Lane, 02/09/2012, Evening, race 12, post #3. RAMS KIZZY KATE, Tucson, 02/09/2012, Evening, race 9, post #7. COACH PRINCESS, Birmingham, 02/08/2012, Afternoon, race 4 post #2. Result: 1-2-3- . ROOFTOP SAWEDOFF, Birmingham, 02/08/2012, Afternoon, race 4 post #5. Result: 1-2-3- . FM SAPPHIRE, Birmingham, 02/08/2012, Afternoon, race 13 post #1. Result: 3-1-4- . DEMO DAISY, Birmingham, 02/08/2012, Evening, race 6 post #8. LAVA MATSUI, Birmingham, 02/08/2012, Evening, race 10 post #2. GABLE GO SHAUNEE, Bluffs Run, 02/08/2012, Afternoon, race 6 post #3. Result: 8-7-2- . GABLE WARBUCKS, Bluffs Run, 02/08/2012, Afternoon, race 10 post #7. Result: 7-4-8- . GALE WW WYNONO, Bluffs Run, 02/08/2012, Afternoon, race 10 post #3. Result: 7-4-8- . CRS SPIDER WEB, Melbourne, 02/08/2012, Afternoon, race 6 post #1. MAGIC TEMPURA, Orange Park, 02/08/2012, Evening, race 5 post #4. Result: 1-6-5- . WP'S CLINTON, Orange Park, 02/08/2012, Evening, race 7 post #8. Result: 1-4-6- . WW'S GUCCI, Orange Park, 02/08/2012, Evening, race 9 post #8. STARZ EQUALMIST, Palm Beach, 02/08/2012, Afternoon, race 13 post #3. Result: 6-8-5- . AMF SULTANA, Palm Beach, 02/08/2012, Afternoon, race 15 post #7. Result: 7-8-6- . JS KERRY OKI, Palm Beach, 02/08/2012, Afternoon, race 15 post #8. Result: 7-8-6- . COUSIN KIM, Sarasota, 02/08/2012, Afternoon, race 9 post #4. Result: 7-6-3- . MADISON SQUARE, Southland, 02/08/2012, Afternoon, race 11 post #4. Result: 4-3-8- . GABLE EDDIE, Derby Lane, 02/08/2012, Afternoon, race 6 post #4. Result: 4-3-1- . GAME PLANE, Tucson, 02/08/2012, Evening, race 6 post #3. RED PERSISTENCE, Tucson, 02/08/2012, Evening, race 9 post #1. Result: 1-5-3- . REDROCK MIRROR, Tucson, 02/08/2012, Evening, race 14 post #3. Result: 8-6-7- . KB'S RUCKUS, Wheeling, 02/08/2012, Afternoon, race 10 post #5. Result: 4-2-1- .